You are looking at the city of Mirny, located right in the heart of Asia, in the Republic of Yakutia, an estate associated to the Russian Federation. 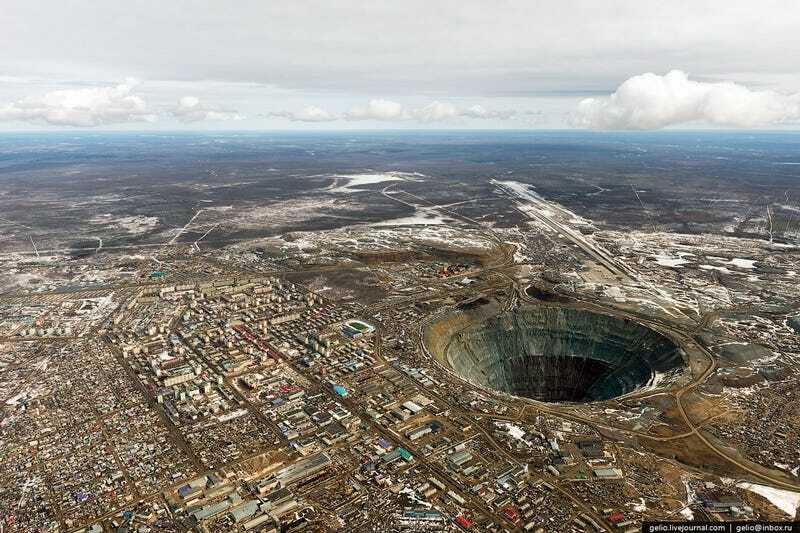 That terrifying hole is an open quarry 525 meters deep and 1.2 kilometers in diameter right next to the city itself. It looks like the gates of hell to me. Here they harvest 25 percent of all the diamonds in the world. The open quarry was opened in 1955, and it became the center of the diamond production in Russia. The open air operations ended in 2009 and, since then, diamonds are harvested underground by these infernal machines operated by demons. Seeing that enormous hole right next to the city defies belief. Apparently the Soviet Union city planners really didn't give a damn about the population.